Christmas! The hands down king of all holidays of the year! There is so much joy, fun, laughter and amusement around. It is the time to let go of all your worries and celebrate. With your near and dear ones, there is no time other than Christmas to celebrate your heart out. It is as if someone gave you a pass to celebrate and have the most fun you could possibly have. And add to that, the weather outside is cold so you can be comfortable, snuggly, and warm inside. Light up a fire at your fire place, throw on a fuzzy warm blanket, put on your comfiest pajamas, and a pair of warm socks! You have just set yourself up for a comfortable laid back evening. Now of course as we all know, we all have different methods of celebrating, and those methods change depending on whether we live with our family, our fiancé, with friends, or mostly whether we have kids or not. Now we can definitely go and party if we are not tied down to responsibilities of any sort and can afford to be a bit reckless, but all that changes when you have kids. Since Christmas is the time to celebrate with family and friends, we must be there to spend quality time with our children. With children, it is always a good idea to make a few easy do it yourselves. It is an amazing way to spend time and really bond with them. As Christmas is just around the corner, why not take this opportunity to sit down and make a few arts and crafts with them that you can later use to decorate the house. So though there are of course plenty of things you can make, one of the easiest things to make, with stuff you probably have lying around, is a cardboard Christmas house. Now you can make a very simple one, which would be plain and straightforward, but since it is the holidays, jazz it up a bit. So here are a few creative ideas you can try out with your children. This is going to be a fun one! All children love stories of castles, and kings, queens, and royalty. They love hearing about the great wars being fought and about the great warriors and soldiers over time who have attained glory. So making a cardboard castle would be an amazing idea. All you would need is a basic rough idea of what you want your castle to look like, print out a templet of a castle of the net for better reference. Get good quality cardboard but make sure it is malleable enough to work with, and cut and put the pieces together according to reference. You can make it as grand as you wish, add several towers and small LEGO soldiers in front. You can also make it more mystical by adding plastic dragons. Another great idea would be to use ribbons as fire spewing from the towers. Ah a wonderful cozy cottage! Nearly all fables and fairy tales talk about something of this sort, so your children might already be familiar with it. It was in the Little Red Riding Hood, Jack and the Bean stalk, and several other stories for children. Again a template would help so get one if you can, or you could do it by yourself too if you are confident enough. Once you have a basic structure done, you could draw on some windows and doors. However, an even better idea would be to cut them out as it gives a more realistic feel to it. Take some drinking straws and color them brown and put them on the top of the cottage to resemble a hay roof. It will most definitely give it a very rustic feel. Now all cottages have chimneys more or less, so make one with a circular piece of cardboard and stick it to the hay roof. Use grey colored ribbons or even wool to resemble smoke coming out of the chimney. Add some fencing too! Remember to color the house to make it more lively and vibrant. Frozen is probably one of the best Animated movies that Disney has come out with. The movie teaches children to accept and love who they are and to never shy away from it. As we all know Elsa, the Ice Queen, built herself a fantastic castle made of ice on top of the mountain. So making a cardboard castle like she made would be a fantastic idea. You will get several cut out references of Elsa’s castle on the web, download one and print it out. Get your supplies, and cut out the different parts required to build the castle from your cardboard. Assemble it together and paint it a blue icy color to imitate hers. You can use cotton to make snow around the castle. In fact, you can also use the cotton to build the snowman that she had built for herself in the movie, and stick him in front of the castle. This one is for the fabulous children who love everything glitter! Make sure you have glitter of all color and some white glue to stick it on with. This one might be a messy project. So remember to layout some newspaper or cloth beforehand, and do your castle making on that to avoid a glitter disaster and also it will make tidying up later much easier. Build your cardboard castle as you would. A good suggestion is instead of buying cardboard for these projects, use the ones you get when you get some sort of delivery or something. The delivery cardboard boxes and quite durable and stable. Once you have your basic castle structure done (use a template if necessary), go crazy with the glitter. Make sure you cover the cardboard well with glue, sprinkle on the glitter, and then gently tap of the excess on a newspaper. You can use this extra glitter for the next part of the castle. Continue till you have yourself a brilliant, sparkly, and glittery castle fit for a fairy princess to live in! As we all know, Jesus was born in a stable. They were living in a village at that time. So it is quite a festive idea to recreate the whole scene of Jesus Christ’s Birth. Make several cardboard houses of different shapes and sizes. Line them up in a way that it represents a whole village. Make the stable to resemble where Christ was born. Make use of straws painted in brown to resemble hay, because that is abundantly found in stables. You can add small plastic figurines for Mary, Joseph, baby Jesus and other people like the three wise Kings who came to visit Christ. Make use of cotton to use as snow in and around the village that you have made. Make a small basket with cardboard and cotton to put the figurine of baby Jesus in. You can also use plastic figurines of horses, cows and other animals to decorate your village as well as the stable. This set up will look beautiful if you put it at the center of your living room somewhere so that people can admire it when they come in. This is also an excellent way to teach the kids about Jesus Christ’s story, starting from his birth. The Grinch is such a favorite Christmas movie. It is heart touching how the Grinch goes from hating Christmas to loving it. In fact, it is frankly quite tear inducing when the Grinch’s heart grows larger and he starts to feel emotions. One of the sets that really stands out in the movie is the Grinch’s house which is built in a way to scare off people. This would be quite an innovative do it yourself to do with your kids. You would require a bit more material for this one, because the more detailed the better. You can put whistles and lights, like fairy lights, in the house. You can also set up some kind of a smoke machine or something. If done right, it will definitely be the showstopper of all your Christmas decorations. Get a small plastic figurine of the Grinch, or if you want to get really artistic, make one with clay or play dough, and color him in. Put him in the window of your magnificent cardboard house as if he is spying on everyone making sure no one is entering his property. Also make sure you make the house on an elevated platform, and cover that platform with cotton to represent snow, because as we all know The Grinch used to live on a very high mountain that was covered in snow. This one is when you want to get super artistic and creative with your cardboard house. Cut out strips of any sturdy cardboard, and paint them a metallic color like silver or gold. Now glue two or three strips on top of each other to make them sturdier. With these strips form a criss-cross like pattern to form a rectangle or square. Join the edges of this square so that you have a box. Now put another one of these cardboard meshes on the top of the four walls to form a roof. It is now ready. You can paint the house in other colors also if you want. You can also stick on a few fake jewels and other things to jazz it up some more. Now this would make an excellent candle holder. Because the candle will throw a cascade of beautiful light across the room and it will form a pretty pattern across the room. This is kind of like the cottage idea but slightly different. Make a more rounded cottage like shape with the cardboard. Cut more cardboard strips to put on top of the cylinder like a thatched roof. You can add a small chimney. Cut out doors and windows. And also paint it in the colors you wish to. Make a small fence around it and put it on a platform covered in green paper to represent the lawn. Put a few pieces of cotton her are there on the lawn to represent fallen snow. This is like a blanket fort but maybe better. Build a life size house that your children can actually play in. This would require cardboard that is quite sturdy though. And also much bigger in size. Cut out windows and a door in a rectangular cardboard piece. Put all the four cardboard pieces together to form the four walls. You can make the roof out of cardboard or even a bedsheet. Put pillow, blankets, and other things inside to make it more comfortable inside. You can do the set up in front of the fireplace so that your children can cozy up in the cardboard house in front of the warmth with a cup of hot cocoa. This can also be an innovative, comfortable, and fun way to make your children read. It is like their house inside your house and they would love their own little private space, making them feel all grown up. If you make this one, they will not leave their cardboard house for hours. 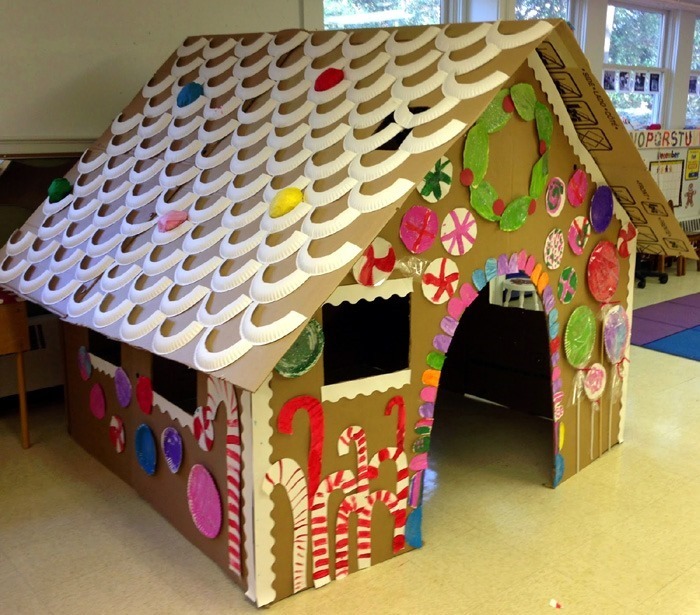 So all of these were some innovative Cardboard Christmas house ideas that you could definitely do with your children. It will be a fun way to spend time with them and will definitely put everyone in the Christmas spirit. Also, by the time you are done, you will have some amazing creations to put up around your home. Also if you choose to do the last do it yourself where you will make a cardboard house big enough for your kids to fit in, your kids will definitely have a lot of fun.